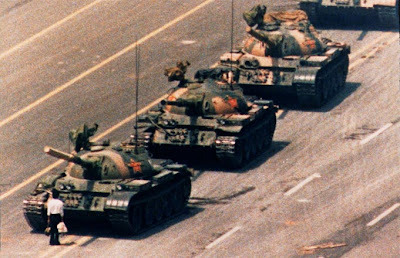 'Tank man' standing up for what he believed in. I am in the midst of trying to gather information and write an APG paper for work I helped plan in the last year or so. We've got what I think is an interesting angle on the business problem, and how we tried to treat the audience, which is good. It's something which i've tried to do across all of my briefs and any business problem I have looked at in the last year or so. So, I thought to help better flesh out what I mean, I might as well blog some of the general thinking in my mind before it's submitted. I'm sure a lot of it will seem as obvious to a lot of people, but I wanted to note it down. After cocking a squint at JWT's Planning Begins at 40, a celebration/look to the future of the discipline (watch the videos, they're good), I was struck by just how many folk called for a fusion between old school data collection - quant, qual and all of the above - and new school, digitally led, adaptable, creatively and intuitively led thinking. Rather like this word document on what's next for planning, provided by the APG (I think Russell wrote it, but I'm not sure, it's not attributed), it all seemed to call for planning to be more adaptive, to help clients not be so short termist and to not get stuck in the sheet music approach to planning and strategy that many practice - to tick boxes and make things fit at all costs. And, I'd suggest there's still a problem between the more formulaic approaches of the old (which seem to lead certain clients easily to box ticking) and the new style (which still can't adequately be quantified, or obviously led back to ROI). I have been told in the past to not get too focused on target audience, for that way leads to generic ads (ads about togetherness for main shopper mums, anyone?). However, what if we went one step further? In a world where target audience definitions can't really be trusted, regardless of what segmentation data tells you - because things are moving too fast on and offline with the changeable economy, the digitisation of content and the exorable rise and rise of opinion being able to destroy brands and new product launches (witness Stephen Fry and the Blackberry debacle - I'm not sure i've met anyone who owns an iPhone, for example, who wasn't aware of this before they chose it), is it wise to rely on it in any way shape or form? Yes, your client will tell you (or the media agency's crafted TGI, in my experience) that buyers are ABC1's who live in the South East, are University educated and are 'heavy users' of the internet. But then, next month Hitwise will tell you that your supposed technologically savvy audience are outstripped by a far older demographic than you thought, who upload more and interact more with the brand's channel. So don't stop at the target audience. Build on it. What attitude are we trying to convey? It's NOT tone of voice, though that is important to the work. Witness APG papers like the Coke Side of Life from 2007 - which worked hard to work to discover an attitude, used research on and offline to establish where that attitude is shared, and targeted those people. It's a long term, targeted approach. Far better to use sniper bullets than tommy gun fire in this instance. Interestingly, at the planning event, Jon Steel quoted an something that Stephen King said about "the end being a certain state of mind in the potential buyer". I'm suggesting we move straight to the state of mind - we tie ourselves to not just a point of view (which is static), but a attitude, which is fluid, and able to adapt and have a point of view about various news/economic/consumer responses. I'm hypothesising, but what if, say, Blackberry's attitude was one of convenience - allying itself with those people who wanted the easiest access to email, and didn't want the inconvenience of a battery poor phone, nor the latest bells and whistles? Their PR strategy writes itself from this, and they could have batted off Stephen Fry's assertations - his attitude would never ever have allied with this. I think it's capable of marrying old and new styles of planning. You have to undertake research to help discover who buys into this attitude, finding out your audience (which may change over time) - but you don't arrive at it, necessarily, from a static process of researching ads. You do hard yards with the consumer, segment, look at historic data and pay a lot more attention to discovering just what attitude the majority of consumers would like your brand to have. It should be the definitive approach to the communication, and work should flow from it. Circumstances may change, but attitudes don't easily. Crucially, it's not a short termist approach; it doesn't just latch on to what's cool and trendy this week, month or year. I think prevailing brand attitudes are best arrived at through detailed ethanography, from the company itself or a combination of the two - this leads to a fluid, culture centric approach in both cases. And you could perhaps use the 'attitude' approach when performing NPD - it lends itself to more purposeful thinking than just a straight segmentation, for who knows how they'll react to a new product and a new environment? Importantly, it can bear in mind the cultural mindset, but doesn't kow-tow to it in the same way just using a target audience might. I'm aware this thinking could come across as a little woolly, but by using something like NPS, by factoring out things like price increases, and using prevailing attitudes that don't tend to change regardless of context, you'd have a way of quantifying just what the work's done. I like to use year on year market share as a first step to answering whether the activity has worked and qualifying its effectiveness. Anyway, that was my random twaddle for the day. Let me know what you think. 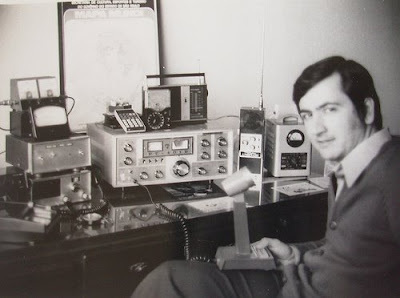 If I was around in the 70s...photo via angatuba-legionaire, usual rules apply. "Journalists are going to have to get used to the idea that their professions have become interests". And it reminded me of the conversation Richard and I once had about whether advertising was a profession or a trade. I was won round to his thinking that it was, in fact, a trade (for numerous reasons - have a gander at his post). To be honest, thinking of yourself as working in a trade gets people to focus on selling stuff, and not to act like rambunctious, conceited advertising wankers (the world doesn't need any more thanks). It also got me thinking about job satisfaction, and how lots of people I seem to know, some three years into their career (given that the first year is usually scrabbling to get in or making your mind up) seem to get along when they can monetise their interests, being careful not to make it become soulless - to do things so much for money that the joy comes out of it. Would you become better at your job if you regarded your work as a collection of interests? It would certainly mean that planners had greater levels of empathy with people, and they'd certainly get on better career-wise. I like to think of myself as having a professional attitude, rather than being a professional myself, who has had to learn specific, set down things - like the names of organs/what they do when studying medicine or case histories for law. You'd have thought that acting like a professional, but viewing what you do as a series of professional 'interests' would have the best of both worlds - you'd take great care in seeing what you do to the bitter end, and turn up on time, and do all the good things that being involved with a profession has - and you wouldn't turn into some achingly twattish person who is a massive jobsworth and who cares about the wrong things. And flip that - assume you are in a profession but it's not a collection of interests (or something that has any interest to you personally). You're dehumanised. You stop viewing your job as something which impacts on real people - regardless of what it is, and become some faceless automaton. You don't stick up for your colleagues because you want to shinny up the ladder, and you don't care who you bugger over on your way to the top. Acting professionally means you care, and having a collection of interests - rather than just one, which could destroy your versatility/love of it all - means you like the links between things. Both useful career skills, never mind just for planning. If the web has given us the tools to determine that history is written by the writers and not the winners now, and that there are many tools for determining the plots and subplots of us personally and professionally, why can't we be the sum of our interests, even at work? If nothing else, it'd get us all to think more laterally, and to not be petty, small minded people who are only defined by our jobs.